A horse-drawn carriage clopped past and I spotted my in-laws, Bob and Mary, waving at us from across the street. My husband Chris, our two little kids and I were waiting for them in front of the Bavarian Belle Riverboat in Frankenmuth. Neither Chris nor I had been to Frankenmuth before, but my in-laws had sung the praises of this town, known as “Michigan’s Little Bavaria.” Up until a month prior, Bob and Mary had lived in Texas. 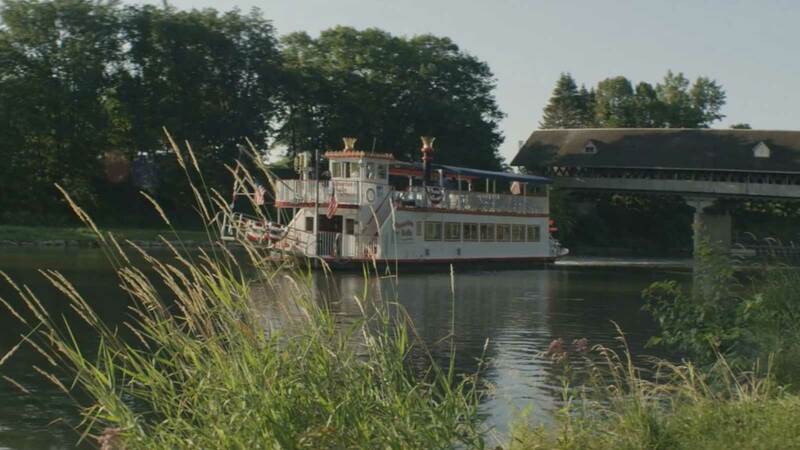 Now retired and back in Michigan, Frankenmuth was centrally located to both our homes and the perfect spot for a nice family weekend. Bob and Mary were excited to finally develop a relationship with their grandchildren. The trouble was, they’d lived away for so long, our kids really didn’t know them. We were all hoping this weekend would help build a connection between them. “Here come Grandma and Grandpa!” I said, looking down at four-year-old Ashleigh and two-year-old Joshua. As Bob and Mary approached, Joshua hid behind my leg and Ashleigh became uncharacteristically shy. I saw Mary hide her disappointment over not getting the hugs she’d probably imagined 1,000 times. Once we all gathered, we went inside the Bavarian Inn Restaurant—one of two in Frankenmuth serving “World Famous Chicken Dinners.” We’d have to try Zehnder’s world-famous chicken dinner another time. Inside, Mary pointed out colorful murals depicting scenes from popular fairy tales, as our waiter, who wore traditional German lederhosen, greeted us. We helped the kids choose from the children’s menu and placed our own orders. Then, the various courses began arriving. First came little bowls of noodle soup followed by fresh-made specialty breads. “What’s that?” Ashleigh asked, looking suspiciously at one of the slices. Mary cut off a small piece. “Give it a try,” she encouraged, offering it to Ashleigh. Ashleigh took a tentative bite and smiled. “It’s sweet!” she said. Chris and Bob both opted for the family-style chicken dinners. I chose sauerbraten, marinated roast beef drizzled with a red wine sauce, and Mary had schnitzel, tender pork loin lightly breaded and topped with a creamy mushroom sauce. Everything was served with hot buttered noodles, dressing and these delicious potato cheese puffs. We walked off that incredible food after dinner by heading downstairs to explore the restaurant’s lower-level Castle Shops. We browsed among toys and collectibles, strolling along cobblestone walkways that evoked the feel of a small German village. Having seen it on their previous visit, Bob suggested we take a ride on the Bavarian Belle Riverboat the following day. From first greetings on the ramp, the staff treated us like family—high-five for Ashleigh, low-five for Joshua and even a fist-bump for Mary for laughs, and sincere welcome all around. While the rest of my group made fast friends with another visiting family, including their puppy, I bought a couple of captain hats from the souvenir shop to give Ashleigh and Joshua that extra, special touch. Their faces lit up when I put them on their heads. The journey was a treat for us all. The guide talked about local history, wildlife and the Cass River, which we were on, that runs through Frankenmuth. When a doe and fawn came to the water’s edge for a drink, Ashleigh hopped up and down, grinning from ear to ear, wordlessly giddy. We also witnessed the fastest turtle I’ve ever seen in my life—the thing scuttled as nimbly as a crab. At the end of the hour-long excursion, the captain let us take photos of the kids at the helm. Absolute treasures! 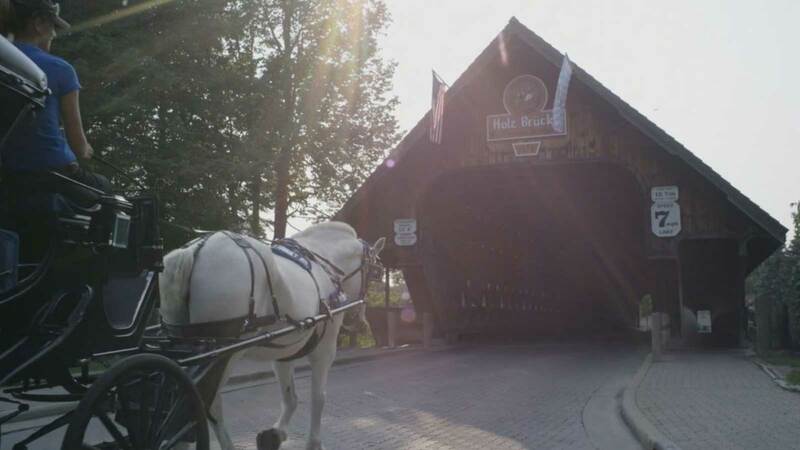 Back in our cars, we followed Bob and Mary across a covered wooden bridge back to the Bavarian Inn Lodge, its colorful architecture reminding me of decorated gingerbread houses. Inside, the kids spotted one of the four pools, and we could barely get to our rooms fast enough to change into our “bathing soups” (as Joshua so adorably called them). Mary, Chris and I splashed around with Joshua in one pool while watching Bob and Ashleigh fly down the nearby waterslides, laughing all the way to the bottom. Later, we played together in another pool with a 15-foot waterfall. I was glad to see how the kids quickly warmed up to their grandparents. Chris and I happily melted into the background as we let the grandparents explore the hotel’s family fun center with the kids. Giggling, they ran through miniature two-story playhouses in the children’s play village, enjoyed arcade games and finished with a round of indoor miniature golf. Afterwards, we all left to roam the eclectic downtown shops, sampling Frankenmuth’s signature chocolate cheese and visiting a woolen mill. The kids let Bob and Mary guide them to the back of the shop. Fascinated, they peered through giant windows and watched workers transforming fresh wool into batting for comforters. Later, we drove to Bronner's CHRISTmas Wonderland. It sprawled the length of one-and-a-half football fields. Inside we were immersed in a glittering Christmas universe. Everywhere we looked, we saw glowing lights, festive trees, decorations and ornaments. To Ashleigh and Joshua’s delight, their grandparents told them that they would buy them each an ornament! I suddenly recalled Chris’ and my first Christmas together. If it hadn’t been for Bob and Mary generously sharing decorations with us, we wouldn’t have had a single ornament for our Christmas tree. After much deliberation, Ashleigh chose a hand-blown glass mouse ornament, and Joshua selected a gold “choo choo,” which he hugged to his chest while we were in the store. By the time we left, Bob was carrying Joshua, and Ashleigh was skipping along, clinging to Mary’s hand. “Can we do this again, Grandma?” Ashleigh asked. Chris and I exchanged a glance and a grin. Success! “Of course!” Bob and Mary responded together, beaming. Before parting to head back to our homes, the kids gave their grandparents about 1,000 hugs and kisses that had only been wishes the day prior. It warmed my heart to watch the kids’ connection with their grandparents develop in the time we’d spent together in Frankenmuth. “We should make this an annual tradition,” Bob suggested. And so we did. It’s now been nearly 15 years. And although our kids are not exactly kids anymore, we all still gather for a weekend in Frankenmuth, where they pick out ornaments, (they have quite the collections for their own future Christmas trees), share bonding time with their grandparents and make memories that will last a lifetime. Let the memory making begin for your family in Frankenmuth!